Black mold on interior wooden baseboard (http://www.mold-removal-remediation-testing-inspections-ma.com/mold-pictures-photos.htm ). See Disclaimer below. WHETHER YOU SEEK a home or an investment property you need to be alert to the potential presence of mold in a structure, especially older buildings. It’s much better to conduct due diligence that rules out or identifies the presence of mold before you buy a property so you may want to consider having an expert examine the building. Why? Primarily because of the symptomatic health issues mold can create, many of which may be incorrectly blamed on other ailments. Secondarily, there’s the question of liability. While different jurisdictions may view the matter from various perspectives, in general landlords might be held accountable under an implied or expressed warranty of habitability for the space they rent (insurance policies should be reviewed to learn if mold related loss is covered). 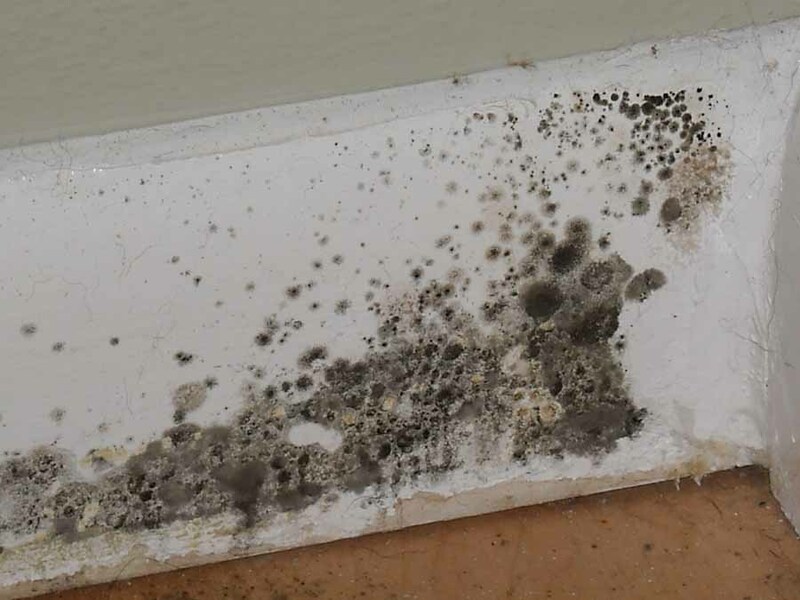 Since mold needs a damp environment to grow, should a landlord fail to repair a water leak or rectify other improper moisture sources and mold results, he/ she may become liable. Ignoring problems like a leaky window, dripping pipe connection or excessive condensation could lead to serious consequences. Unlike the photo above, the existence of mold may not be obvious. It can grow on the underside of walls and floor boards. But being out-of-sight doesn’t mean it is harmless as the effects of mold are basically caused by airborne spores. So even if it is hidden, occupants may still suffer. Among other things, some of the symptoms associated with mold can be sneezing, headaches, nose bleeds, diarrhea, swollen glands, loss of energy, disorientation, concentration/ memory problems, shortness of breath, weight loss as well as sinus infections and bronchitis. Some folks may suffer more dire experiences. Be sure to visit http://moldgeek.com/black-mold-symptoms/#sthash.F4XPgvwX.dpuf for additional details. If occupants are complaining of ailments mentioned in that website, it may be a good idea to have a search conducted for mold. But think twice if you decide to locate and remove it yourself as special precautionary preparations are necessary. Moreover, some mold species can be toxic (black mold, for instance). Having a qualified professional remove the mold is likely to be the better removal solution. Disclaimer: This blog is intended to promote discussion and general interest in the presented topic. At no time should the reader rely upon or act upon any advice, suggestion, speculation, comment and/or fact that may be stated in or implied in this blog without the consent, guidance, oversight and performance of a professional qualified in the subject matter. Links, references and credits in this blog are for informational purposes only and are not endorsements by the author or Inhouse Corporation. This entry was posted on January 12, 2014 at 18:58 and is filed under Property Management, Real Estate. You can follow any responses to this entry through the RSS 2.0 feed. You can leave a response, or trackback from your own site. and take them to a hazardous waste dump for disposal. facts about their education, training, and business. the moisture content that molds, mildews, and bacteria like to grow. into the budget is key to protecting the most valuable of investments.